by receiving cooperation and the advice from Okayama Prefectural Federation of Business Associations（岡山県中小企業団体中央会） and the expert at a fast pace. 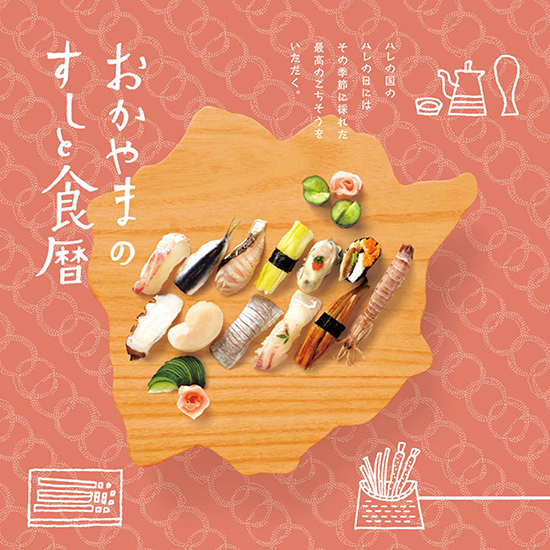 In this brochure, we tell the basics of the sushi is to have thorough feelings to the material of the seasonal fish (the material”neta”) which can eat only in the season. Obediently without disturbing taste of the material of the natural product (Okayama product) in particular, we want our customer to feel the season. I want many shops which are active and have ambition to rise up to apply. It is important so as to be strong if each person’s personality is strong. I have oneself appeal well, and there is not the greatest good luck if I have a visitor have it. In addition, even one case will be able to join the members of　our association based on this document. “I have never taste such a delicious sushi in my life” Steven Paul Jobs said. We want to hear such a heart-warming words from many people. And all the members of an association do their best so that the Okayama original food culture where charm was condensed is informed.